Baked Salmon - How to Bake Salmon in the Oven - Easy and Delicious! This Baked Salmon is my preferred way to cook fresh salmon from the grocery, as it’s easy, delicious, and cleanup is a breeze. Serve it as the main dish for dinner, toss it in a mixed green salad, shred it for picnic-friendly salmon salad, and more! I’m not exaggerating when I say I cook this salmon at least once a week. 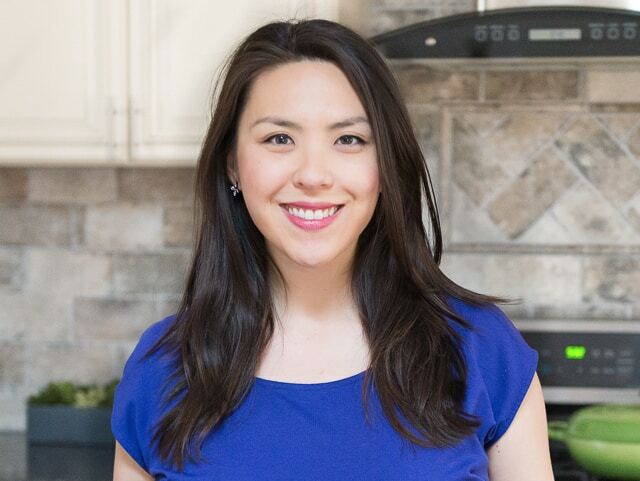 It’s an integral part of my meal prep and my family always loves eating this recipe. If I’m being honest about my favorite way to eat salmon, it’s hands down a pan seared Crispy Skin Salmon just like at the restaurant, where the skin is like a crunchy potato chip on top of the fish. However, that’s a more involved process that involves de-scaling the fish and perfecting the sear, and it’s only meant to be eaten right away. 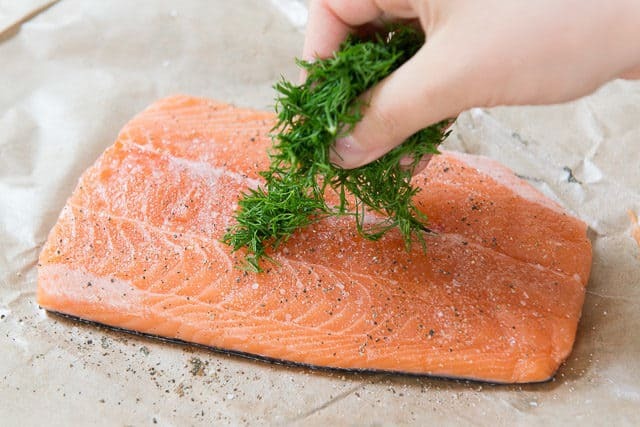 This Baked Salmon Recipe is simple as heck to prepare, and you can enjoy the salmon as is, with flavorings like dill, Dijon mustard, or lemon, or in other dishes. I usually roast it off in the oven, then add it as the protein for lunchtime salads, or make Salmon Salad out of it (like a tuna salad, but with salmon). Because I cook salmon so often, I’ve experimented with many different temperatures and cooking times. I find that oven baked salmon cooks best at higher temperatures for less time. 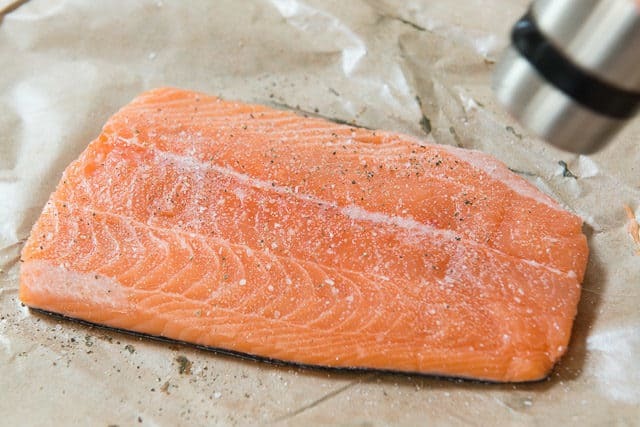 Let’s dive in to how to bake salmon. 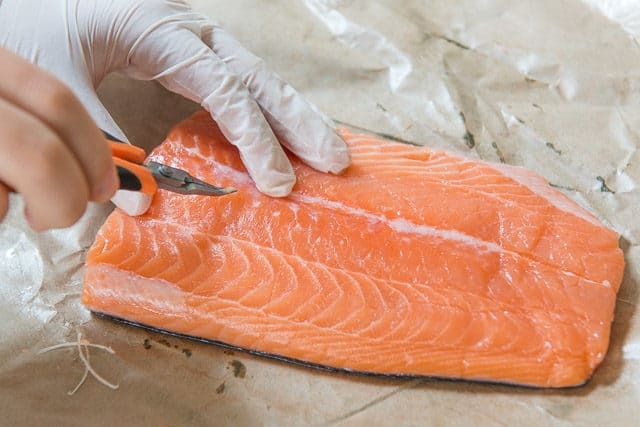 Always remove the pinbones from your salmon fillet, as they are particularly big and thick, and a choking hazard. Sometimes the fishmonger has already removed the bones from the salmon, but when you have to do it yourself, it’s easiest with tweezers. Trust me, you cannot pull the bones out with your fingers. Because I make salmon so much I bought these tweezers (here’s a cheaper $6 option). I’ve also been able to pull them out with tongs in a pinch, but it’s a little tedious and harder to grip. To remove them, you can feel along the flesh to see where they are poking out, then grab them with the tweezers. Sometimes if I have it, I’ll add freshly chopped dill. Other nice toppings are Dijon mustard mixed with pure maple syrup, teriyaki sauce, or simply a sprinkle of smoked paprika. If I’m using the salmon for salads or other dishes, I’ll just leave it plain with salt and pepper. First, I like to prepare a foil-lined or parchment paper-lined tray to place the salmon on for baking. Even if you grease the bottom of the pan with oil, the salmon skin always sticks anyway, and it’s a pain to scrub it off. So I make cleanup easy by lining the pan. 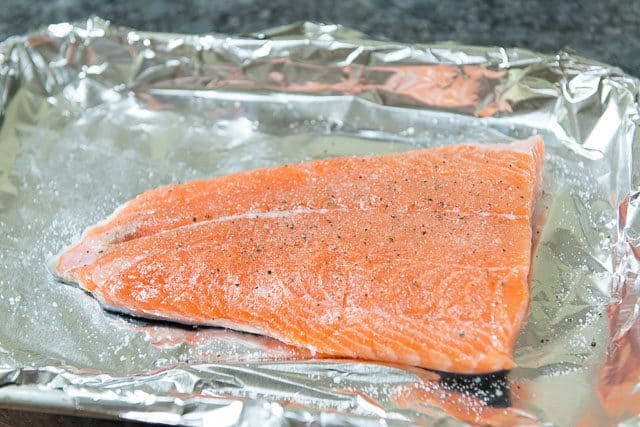 Typically for a 1″ thick piece of salmon, about 12-14 minutes is perfect in a 425F oven. Remember that the maximum temperature you want to cook salmon to is 140F, which is fully cooked (whereas chicken is 165). I usually aim for 125-130F so there’s still some pink inside. If you’re using wild salmon, you’ll want to watch the salmon more closely, as there’s less fat there and it’s easier for it to dry out. I buy the same size piece from the store so I’ve learned what the timing is, but if you crack the oven door and look, you’ll see when the salmon has changed from the deeper orange and shiny/glossy exterior, to the cooked lighter orange color and more opaque exterior. Once the shiny exterior is gone, it should be done within a minute or two, and you can double check with a thermometer. 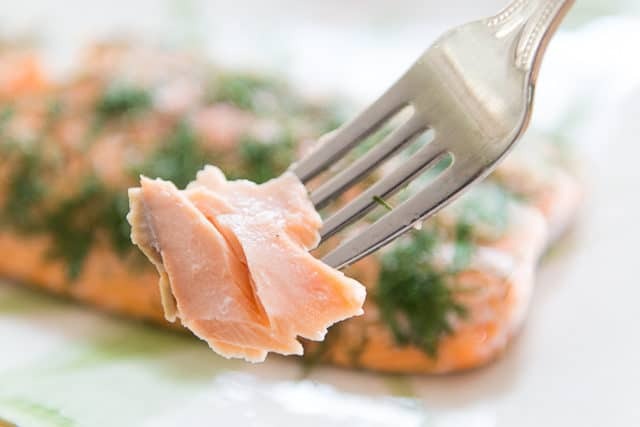 Wild Salmon is more prone to becoming dry and overcooked, as it generally has less fat than farmed salmon. I’ve tried 8 different varieties of farmed and wild salmon, and my preference is for the farmed Atlantic Salmon they have at Whole Foods. 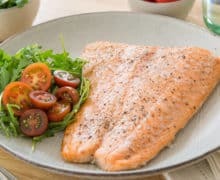 Even the wild salmons can vary a bit in fat content, so I suggest you go for the higher fat fish, as they’re more forgiving if you accidentally overcook them. 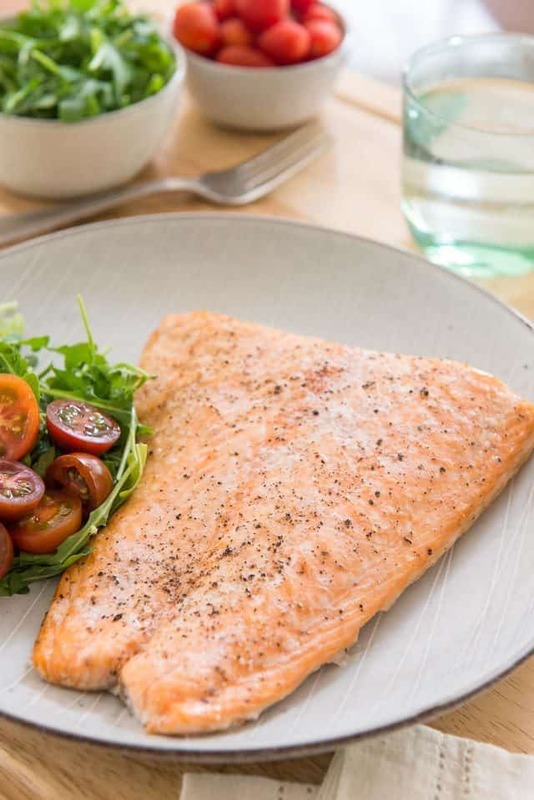 This Baked Salmon is my preferred way to cook fresh salmon from the grocery, as it's easy, delicious, and cleanup is a breeze. It's great for adding to salads, making salmon salad, and more! Preheat the oven to 425F. Line a baking tray with aluminum foil or parchment paper. Unless they've been removed already by the fishmonger, remove the pinbones from the salmon fillet with tweezers. Season the top of the salmon generously with salt, about 1/2 tsp for a 1lb piece. I don't season the bottom of the fish, since I discard the skin. Add freshly ground black pepper to the salmon, about 1/4 tsp, or to your taste. Place the fish on the lined tray, and bake for 12-14 minutes, until the top is no longer shiny and the fish registers between 125-140F in the middle, depending on desired doneness. 125F is for medium, and 140F is for fully cooked salmon. 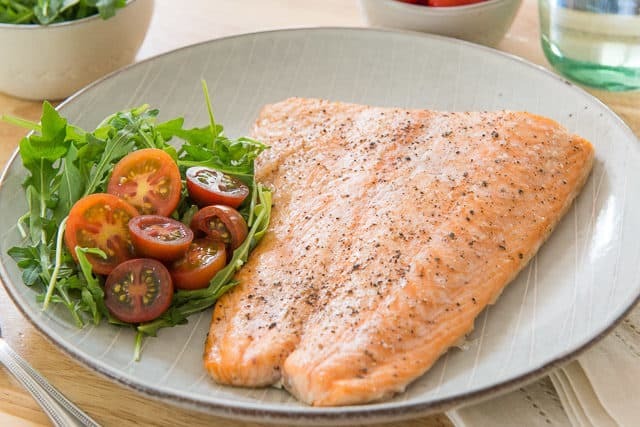 This salmon is great for adding to salads, and also making Salmon Salad out of it (like a tuna salad, but with salmon). You can also enjoy it plain, or add simple seasonings like fresh dill, dijon mustard, maple, teriyaki sauce, and more. I found it took a full 20 minutes to raise the salmon to 140 degrees at the oven tested temperature of 425 degrees. Otherwise very good. Very easy and very good, as advertised. I add a bit of lemon juice over the top, and seasoned pepper, etc… just whatever comes to mind at the time. There’s a comment in the narrative about the skin side sticking to the pan. I like to eat the skin, and DON’T have that sticking problem by using the foil as recommended to line the pan and spray a little cooking oil, like Pam, on the foil.